Nikos played solid during the whole tournament and had to win against Wojciech Szewczyk of Poland for the title. 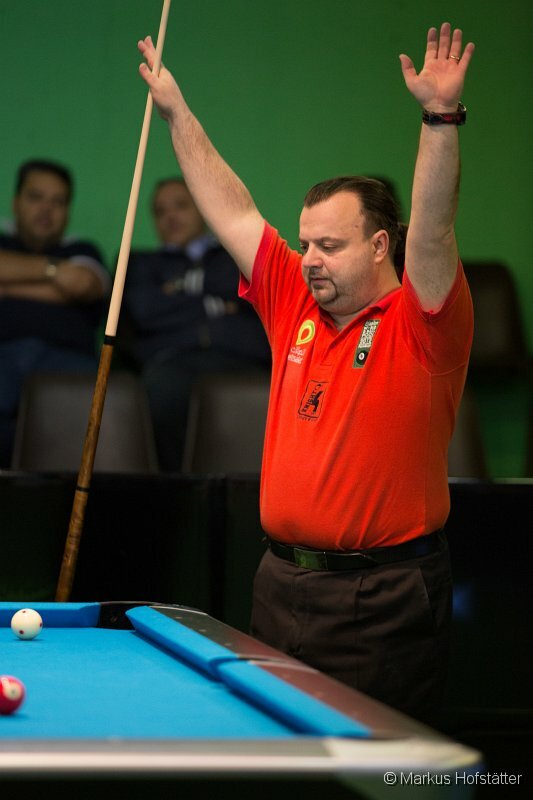 Some of the spectators called Wojciech god of billiard because of his beautiful stroke. It was also a pleasure for me to watch the 17 year old kid. Nicolas Otterman of Germany and Marcus Chamat finished third. Artem Koshovyi, Roman Hybler, Niels Feijen and Bruno Muratore shared the fifth place. A strong playing Phil Burford shared the 9th place with Ralf, Nick, Darren, Oliver some others. It’s always beautiful in St. Johann and worth to come for the Eurotour. So hopefully I will see you again next year. Do you need photos or posters for your poolroom ? Click on the Banner and you will get everything you need. Click on the picture to jump to the gallery.